If you have never had a fly rod in your hand or you are a struggling novice this seminar is for you. This is an extensive introduction to flyfishing and it is equipped for the beginner or the novice. For more personalized attention, we limit the seminars to six students with a minimum of two. You will learn about balancing an outfit, selecting your rod, reel and line, reading the water, fly selection, knot tying, tapered leaders and tippets, stream side entomology, stream side etiquette and more. This is a hands-on flycasting and flyfishing experience. The seminar begins at 8:00 a.m. on Saturday and ends at 5:00 p.m., followed by dinner from 6:00 p.m. to 9:00 p.m.. Sunday begins at 8:00 a.m. and concludes between 4:00 p.m. and 5:00 p.m..
Class on Saturday consists of classroom lecture and on the water casting instruction. Sunday will be a full day on the Wild Trout Section of the Lower Owens River with a short lecture on stream side entomology and fishing techniques. The fee for the seminar is per person and includes all instruction, materials, equipment if needed, lunch for both days and a complimentary dinner on Saturday evening. The dinner consists of a BBQ with all the trimmings, hosted by Gary and Pat at their home. All guests are welcome to the dinner. If you have a hard time nymphing the Lower Owens River or Hot Creek and you want to learn more about nymphing, this seminar is for you. This is an intensive 2-day seminar on nymphing techniques as well as Czech nymphing. You will learn how to select the equipment for a balanced nymphing outfit, various nymphing techniques and rigging, reading the water, fly selection, stream side entomology, stream side etiquette and more. This is a hands-on flyfishing experience. You will sample the aquatic insects that the trout actually feed on and learn more about matching the hatch. You will also learn how to obtain drag free drifts, mending line and other casting techniques. This all takes place on the majestic Wild Trout Section of the Lower Owens River. Class on Saturday begins at 8:00 a.m. and ends at 5:00 p.m. It consists of a classroom lecture and on the water instruction with a short lecture on stream side entomology. This is followed by dinner from 6:00 p.m. to 9:00 p.m. Sunday begins at 8:00 a.m. and concludes between 4:00 and 5:00 p.m. 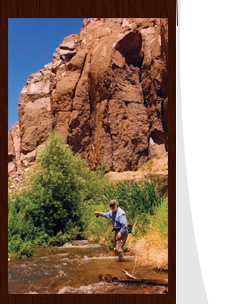 It consists of a full day of fishing on the Wild Trout Section of the Lower Owens River. The fees for the seminar are per person and include all instruction and materials, fly rod outfits if needed, lunch for both days and dinner on Saturday. The complimentary dinner is a BBQ with all the trimmings hosted by Gary and Pat at their home. All guests are welcome to the dinner. For a more personalized touch we require a minimum of two students and limit it to a maximum of six. This is an intensive 4-hour class with the emphasis on casting and fly fishing methods. You will learn various casting techniques, short line f presentation, fly selection, reading the water, knot tying, stream side entomology and etiquette. During this private session, with the majestic snow capped Eastern Sierra Mountain Range as your back drop, you will actually fish for wild brown trout in the Wild Trout Section of the Infamous Lower Owens River. The first half of the class concentrates on casting and is held in Bishop�s city park on the pond. The remainder is held out on the Lower Owens River. In order to give the beginner the personalized attention that is needed, this class is limited to a maximum of two students. The fee for this 4-hour introduction is for one or two people and includes all instruction, equipment if needed and fishing. This class is offered throughout the year and may be scheduled at any time.